We LOVE volunteers! Over the years volunteers have played an integral role in the growth of our organization. 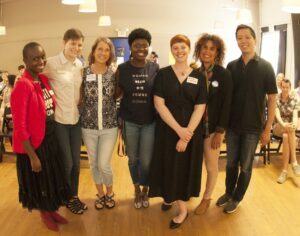 Our volunteer program offers unique ways for you to contribute to our work of providing, protecting and expanding access to reproductive healthcare. Apply today! Apply your skills and gain awesome new ones. Engage with your inspiring peers and leaders. Become part of the reproductive health, rights, and justice movement in Georgia. Whether it’s tabling at fairs & festivals, joining us at the Capitol, fundraising, planning events, making signs, making calls, becoming a clinic liaison, or working behind a computer, we have a TON of opportunities for you. You can see our events calendar to sign-up for volunteer events and opportunities. We are committed to making this a meaningful and enriching experience for you. We will do our best to match your skills and interests with the opportunities available. Apply TODAY and join our work!